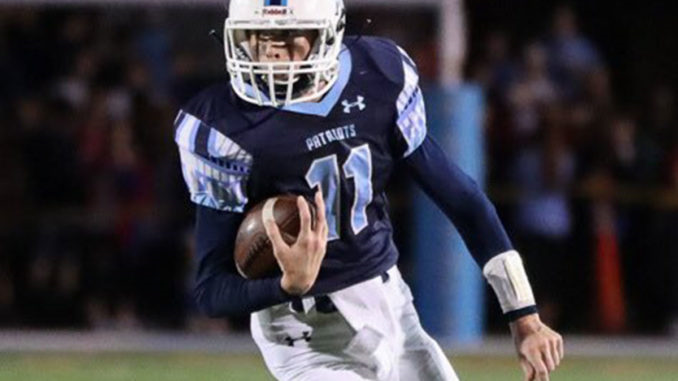 Last night BYU got a verbal commitment from under-the-radar Virginia wide receiver and defensive back Tanner Wall (Class of 2018), who will be joining the Cougars as a preferred walk-on. Wall preps at Yorktown High School (Arlington, Virginia), where he had 55 receptions for 857 yards (1650 all-purpose yards) and 17 touchdowns as a senior. On defense he had 131 tackles including nine for loss, with two interceptions and eight pass breakups. He was named to the first team for All-Met (WR), All-NOVA (WR/DB), All-Region (WR/DB), All-Conference (WR/DB/PR) and was named the 6A Liberty Conference player of the year. As a junior he also put up big numbers as a receiver, defensive back, punt returner, and quarterback. Wall has seen recruiting interest from Columbia, Harvard, Princeton, Virginia, William & Mary, and Yale. While he is coming to BYU to play football he is also being recruited as a baseball player. I caught up with Wall to ask him about his commitment. Wall: Because I know it’s a place where no matter how you get there, or where you come from, there is a strong focus on developing character and the whole individual. And because the men and women who teach and coach there value integrity and hard work. Wall: Because not only are they supportive of athletes serving missions, but they also encourage it. It’s also a good fit for me because they historically throw the football a lot and that provides the opportunity for lots of receivers to develop and have the opportunity to be used in the offense. Wall: Being part of a football program with such a history of success and to battling every week with my teammates and pushing and encouraging them to be their best. I’m looking forward to running onto the field wearing Cougar blue and competing against some really great football programs. Wall: I was a late bloomer so recruiting didn’t heat up for me until my junior year. Here in VA the schools that showed me love were William and Mary, Richmond, and UVA. I love what Bronco Mendenhall is doing at UVA and love his blue collar, earn every play, coaching style. A handful of the Ivy League schools showed me love with Princeton and Columbia leading the pack. Wall: I’m a huge fan of movies like Rudy and Rocky where the underdog overcomes all odds and adversity to shock the doubters. I like 80’s movies and 80’s music as well as Linkin Park, Imagine Dragons, and James the Mormon. I love the book Good to Great and love the quote “Good is the enemy of great”. I love breakfast sandwiches with bacon or Duck Donuts (a donut shop here on the east coast that came out of a beach town called Duck North Carolina). BYU Insider: What is your greatest accomplishment? Wall: My greatest sports accomplishment was probably helping my team win the VA State Title in baseball while being named the State MVP. No team from my city had ever won the state title before so that was pretty special. Helping my high school football coach earn his 250th win this past season was pretty special too. Greatest life achievement has probably been earning a 4.3 GPA and staying true to my values and character in an environment where my beliefs and standards are seen as very “old fashioned”. Wall: A wise man once shared a quote with me – “People love you when you’re average because it makes them comfortable. But when you pursue greatness, it makes people uncomfortable. Be prepared to lose some people on your journey.” I have found that the more success that I have achieved in my life, the more my character and values have come under attack. So the best advice has been to kill others with kindness… and success. BYU Insider: Who is a player (collegiate or pro) that you seek to emulate on the field? Wall: Austin Collie. He didn’t have 4.3 speed or 6’3 size, but he understood how to run routes and set up DBs. He caught everything thrown near him and was tough and quietly went about schooling defensive backs. He made “magic happen”. Wall: How grateful I am to have the opportunity to represent BYU as an athlete. I’m a hard working player who has earned every play and opportunity of my sports life. I will bring that work ethic to BYU and even if I never find the field at BYU as a starter, I will do my best to challenge my teammates and to push them to reach their potential.